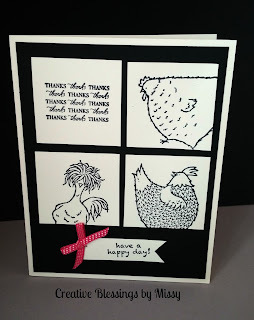 Creative Blessings by Missy: Hey Chick! I created this cute card using my favorite Stamp Set from SaleABration - Hey Chick! This stamp set is FREE with a $50 order and is available while supplies last or until March 31st. I love to create clean and simple cards. This Thank you card has a POP of color from the ribbon! Just click on my Shop now button on my blog to place your order!